Lunch and some writing time. Sometimes I like not planning out what I'm going to write for my Slice of Life posts. That way, as I move through the day, I can pause and see if I get inspired to write by something. What I often find as I move through this month is that writing begets writing. I know this to be true, of course, but somehow I always manage to forget it once the challenge is over. In life, anything I make time for, I tend to come back to. When I do "x" a lot, it gets easier. It's true in running, it's true in reading and writing. But still, I forget. I'm often told I get things done "quickly" - grading, writing, reading books, etc. The truth is, I have way too many balls in the air. If I get something I need to do, I do it immediately or that task will fall from the juggling circle, only to be forgotten about. That's the first secret. 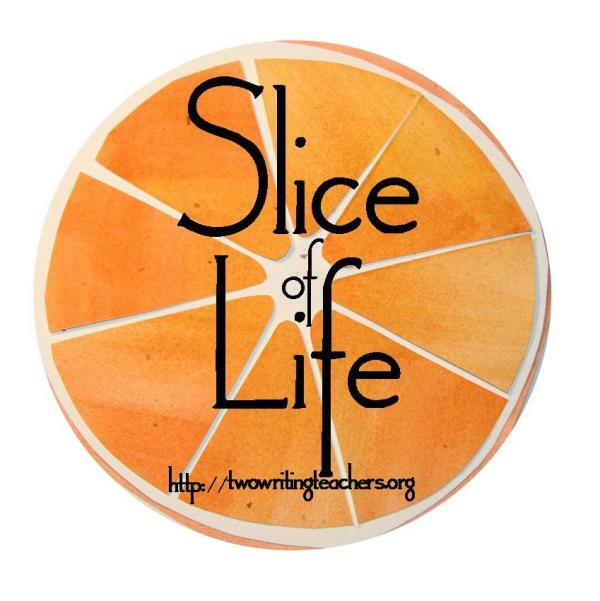 As for Slice of Life writing, I was extremely hesitant to take on the challenge this year. It had been three years since I participated for good reason. There is far too much going on. Yet I knew I needed to get back to writing, so I structured it. I write my posts at night, but not for that day. What I mean is that as of the typing of this post it is 8:11pm on Sunday. Now, I could just write that day's post at night, but I know myself. The feeling all day that I had something due, but not done, would make my anxiety spin. I would never make it through the month at that rate. So, the night before I write my post and schedule it for 5am the next day. If something were to happen, I could always get up in the morning and write, but I really like going to bed and knowing it's done. This was somewhat of a problem Friday and Saturday nights - we were driving home from the basketball games from 9-11:30pm each night. Enter the app, Google Keep. Both nights my husband drove as I typed out posts on my phone into that app. When I got home I copied and pasted the posts, uploaded some photos, and voila! Post was done. Today I needed to get some writing done for a friend. She messaged yesterday and had a topic she needed written up, 750-1000 words, and it needed to be done within a week. I liked the topic, love the friend, and was glad to write for her. I knew if I waited for the week to begin, I'd run out of time. So I mulled over the topic since reading her email yesterday and went to lunch on my own with my computer. Two hours later, I had a piece I was proud of, she was happy about, and I knew I could meet her deadline. Time. As much as I wish I could find more, it is ever elusive. The only thing that works for me is working ahead and this challenge reminded me of that once again. Slice of Life is a challenge hosted by Two Writing Teachers.